Prostate wi seminal vesicles an seminal ducts, viewed frae in front an abuin. 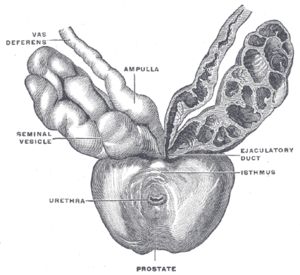 The prostate (frae Greek προστάτης, prostates, leeterally "ane who staunds afore", "pertector", "guardian") is a compoond tubuloalveolar exocrine gland o the male reproductive seestem in maist mammals. ↑ Harper, Douglas. "Prostate". Online Etymology Dictionary. Retrieved 2013-11-03. ↑ Tsukise, A.; Yamada, K. (1984). "Complex carbohydrates in the secretory epithelium of the goat prostate". The Histochemical Journal. 16 (3): 311–9. doi:10.1007/BF01003614. PMID 6698810. This page wis last eeditit on 21 November 2015, at 18:10.